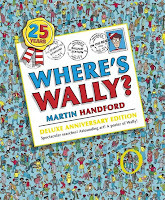 This Deluxe 25th Anniversary Edition will bring joy and entertainment to the Where’s Wally fans of all ages. It begins with the fold- in flap of the front cover with a spot-the difference challenge. It depicts nine sets of stamps with the same design to be discovered. One stamp in each set is different and has to be found. Wally has set out on a worldwide hike with his friends Woof, Odlaw, Wenda and Wizard Whitebeard. They all lose something that has to be found. 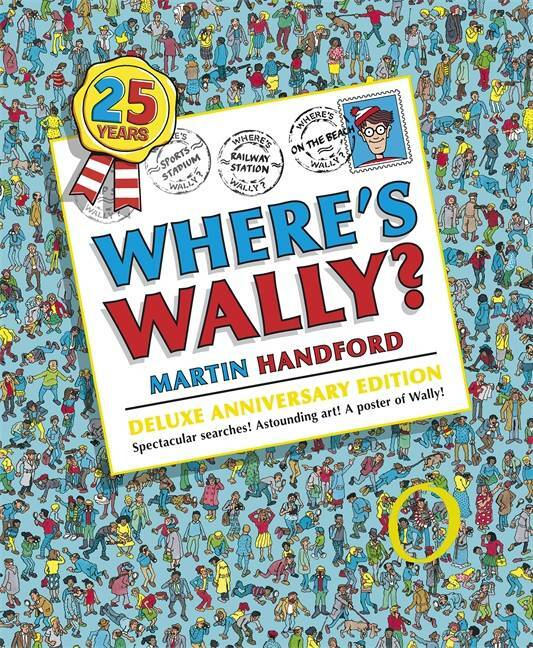 The book contains a postcard from Wally to various people, from each place he visits. This is depicted on the front of each flap that introduces each of the twelve double spreads containing scenes from: In Town, On the Beach, Ski Slopes, Campsite, Railway Station, Airport, At Sea, Museum, Safari Park, Sports Stadium, Department Store and Fairground. A checklist with each spread engages the reader in observation and play where they must find the listed scenes or people. Below the checklist there are special souvenir stamps of animals and people Wally has met on his travels through each particular area. The pictures on these stamps are also represented within the double spread that follows and again, the reader is entertained by the challenge to find the pictures from the stamps. The book is the same Wally size, with a book cover checklist on the flap of the back cover. These challenges are amazing, entertaining and a good exercise in observation for children and adults who love to use their eyes and mind.